Overview — Form may follow function, but it does not always have to be pretty. While the goblin shark is well adapted for its deep-sea habitat, some people have referred to this fish as "the ugliest living shark." Still others liken it to an alien from outer space. Its mostly pink body contains soft, flabby flesh. Perhaps its most distinguishing feature is its uniquely shaped head. The shark's beak-like snout protrudes like a trowel, making it perfect for investigating muddy ocean bottoms. When the goblin shark retracts its jaws, the snout looks more like a really long, pink nose. Since this shark frequents deep waters, sunshine does not provide much light at such levels. The goblin shark, therefore, has very small eyes, and must often rely on its other senses for detecting predators and prey, as well as for directing movements. Feeding Habits — The diet of goblin sharks consists of crabs, deep sea fishes, shrimps and other organisms within its habitat, which covers regions off Japan, Australia, Portugal and South Africa, as well as portions of the Atlantic Ocean. Its teeth are shaped like long needles that the shark can manipulate like a grasping claw. 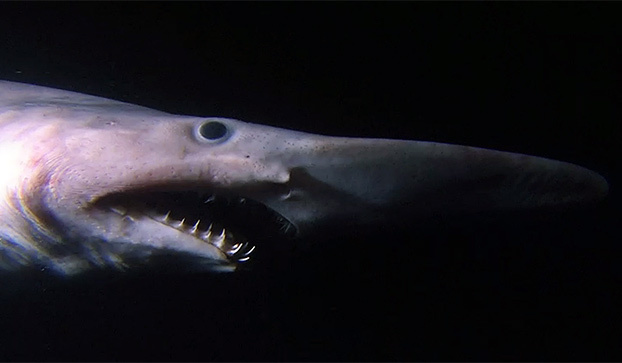 Locating meals may be tricky, but once prey is detected, it stands little chance of escape as soon as the goblin shark sinks in its teeth. Cool Fact — The goblin shark's scientific name honors two men, Kakichi Mitsukuri and Alan Owston, who both helped with this shark's discovery at the end of the 19th century.